Catherine was, according to her legend, the daughter of a fourth century noble family of Alexandria, some even say the daughter of Costis, the brother of Emperor Constantine, and Sabinella, daughter of the King of Egypt. She was very well educated, especially in the philosophy of Plato. Some accounts of her life say she was converted to Christianity by a vision of the Virgin Mary with the infant Christ, others that a hermit had a vision and came to Catherine and converted her. When Emperor Maxentius began persecuting Christians, Catherine, only eighteen years old, went to his court and rebuked him and criticized his gods. He called in fifty of the most learned philosophers in Alexandria to argue against her, but they could not. They were all converted to Christianity. The Emperor had them all put to death. When Catherine then refused an offer of marriage, he condemned her to be imprisoned and tortured. But while she was in prison, she converted the Emperor’s wife, one of his army officers, and many soldiers and guards. Maxentius had them all executed and sentenced Catherine to be killed on a spiked wheel (from which comes the term Catherine Wheel). But the wheel shattered, and she was unharmed. She was finally beheaded. Her body was taken by angels to the top of Mt. Sinai, where her shrine is still maintained by monks. Early records of pilgrims to Mt. Sinai don’t mention her remains, however; they seem to have been taken there around 800 C.E. by monks who lived in a monastery established there in the sixth century. The veneration of Catherine became widespread in the east in the tenth century, and it spread to the west during the time of the Crusades. She is one of the Fourteen Holy Helpers, saints who are known to be the most helpful interceding for people who pray to them in times of sickness, danger or serious trouble. (See also the windows of St. Margaret and St. Pantaleon, who are also among the Holy Helpers.) Catherine is worshipped as the patron saint of maidens, philosophers, students and preachers. Because of the wheel of her torture, she is also the patron saint of wheelwrights, millers and mechanics. Her feast day is November 25. Catherine is often portrayed with the spiked wheel of her torture, although it is not pictured in this window. She is always wearing a crown, itself spiked like the wheel, and dressed like a noble woman; she holds a palm, a common symbol of victory through martyrdom, and a book, symbolizing her great learning. In our stained glass window, a three light window with tracery above, Catherine has the palm frond and a book and is flanked by two angels in the left and right lancets. In the tracery above are other angels and cherubim. Behind the main three figures is Mt. Sinai. The lilies that surround Catherine represent her purity and her virginity. The birds over her head allude to the legend that while she was in prison, she was fed by a dove sent from heaven. 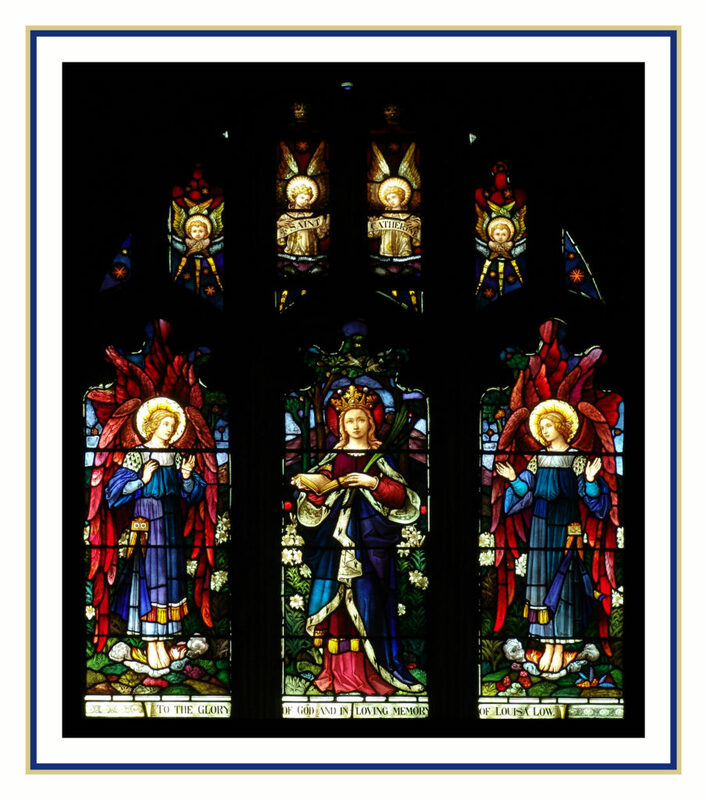 The window was given to St. John’s in memory of Miss Louisa Low by her students. Miss Low had been a teacher at Miss Catherine Richardson’s school, and when Miss Richardson retired, Miss Low bought the school and changed its name to The Low School. It later became Low-Heywood, which merged with other schools to become King-Low-Heywood-Thomas. Miss Low died in 1916. There is no record of this window’s installation or dedication at St. John’s, but it was not part of the set created by James Powell & Sons for the south wall of the chapel. Based on stylistic grounds, Peter Cormack of the Morris Gallery in Great Britain attributes the window to Clayton and Bell of London, from a cartoon by George Daniels, who designed many windows for the firm, as well as windows for other churches. Location: Over the altar in the chapel. Inscription: To the Glory of God and in Loving Memory of Louisa Low.